Image by Costa Rican Resource via FlickrAn article I read in the TicoTimes has had me realing thinking the last couple of weeks. The main diet of Costa Rica is rice and beans which is made by the locals. Back in the day lawyers, doctors, school teachers, and students all use to get there rice and beans plate at little places called Sodas that were spread out all over the country that were little family owned places to eat. It turns out that there are 29 new fast food places opening up in Costsa Rica alone including McDonalds, KFC, Taco Bell, ect. The most dissapointing part about this is that to eat at one of these places is not looked at as a status symbol. Which basically means you are cool if you eat at a McDonalds after classes or if you can afford to bring your whole family to eat at McDonalds and then talk about it. This is a sick style of living that I dont like and I dont see a healthy outcome in the future for it. As the USA knows from experience this will only lead to a more obesity in the population. The problem with this is that Costa Rica has been known for offering free health care to its people but in general it has had healthy people because of healthy diets and healthy diets of living. The USA spends $14,000 per person on medical care while Latin America spends a mere $300 per person. When you bring more french fries and whoppers into the country you bring a much higher medical bill also. The Costa Rican people also use to work in fields and walk everywhere. Now they are very educated people, public transportation, and many now have cars. There is much less daily excercise today than the Costa Rican of 30 years ago. This change in diet and change in physical activity could bring a rise in medical expenses. I would like to give a huge thanks to McDonalds, Burger King, Wendys, KFC, and Taco Bell for allowing the Costa Rican government to have to worry about a rising cost in their expenses in medical cost. What are your thoughts on fast food chains in Central America? 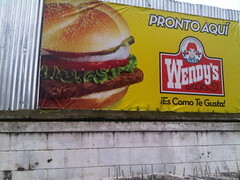 I just loathe the US fast food chain restaurants here in CR. First of all, their ugly buildings are destroying my view, and secondly, it drives me crazy to see that it is somewhat of a status symbol to eat at one. In my town, it seems like 80% of the clientele are teenagers...Que triste.